Building a stud wall is HARD work unless you have a significant amount of experience to call upon to help you through it. Remarkably, there are a few little things and processes that you can go through to help get your stud wall going and up in no time. We reckon that by implementing these simple DIY do’s – you can have your stud frame up in half the time it would normally take. And in this definitive guide, we are going to show you exactly what those easy tasks are and how you can start building a stud wall for yourself. It can be incredibly tempting to get stuck in and start sawing wood, taking measurements and getting a little excited when you first decide to have a go at building your own stud partition wall. However, in my experience, I have found that PREPARATION is key, and it’s helped me massively over the years. One, your plans meet the current regulations set by the building authority. And Two, that your stud wall is not going to significantly alter the buildings ability to resist fire, light or ventilation. You can contact the Milton Keynes Building Control here. Heating and plumbing, such as boiler installations in Milton Keynes if it is going to be a separate room. There will need to be a heating supply as well as plumbing and lighting. When you start building your stud wall, there are four main areas to begin. There is almost certainly a “ceiling plate” which will be fixed to the joists above, as well as a matching length that has been secured to the floor. This is the “sole plate”. Between the two plates you will have two equally spaced pieces that have been secured with nails. You will then proceed to fitting the “noggings” – these are short pieces of material that keep the stud frame secure. You will need to check what is lying behind any structures before you start building a stud. You can use an electric detector to check for any metal joists, fine cabling and plumbing pipework that may be hidden behind any walls, ceilings and floors. Once you’re satisfied that the area behind the walls is clear you can begin to position your stud frames and mark where you want it to begin. Using the mark that you have made on the skirting board or floor, create and hang a “plumb line”. Using a marker, follow the plumb line up to the ceiling and mark the ceiling line using a small piece of off-cut wood. Using a small nail and the mark on the ceiling that you have just made – gently hit a nail into the ceiling, as close to the wall junction as you can. Mark and make a guideline to show the ceiling plates true position. We advise using a small piece of coloured chalk, as it tends to work best. You will need to identify the ceilings joists again using an electronic detector; alternatively, if you cannot find them then we have found that probing the ceiling with a small screwdriver is also rather effective. Measure and cut your timber frame to size so that it matches the length of the ceiling plate. Hold the plate in place and mark the fixing points. You may find this difficult and could need assistance. If your fixing points are placed directly underneath a joint, they will need to be placed a 400mm intervals. Once you have finished the fixing points, remove the ceiling plate and make a number of clearance holes for the inevitable screws. Builders in Milton Keynes will tend to fix the plate into position along the chalk line that you would have drawn earlier. It certainly helps to have someone offering a helping hand if its available. If you plan on fitting a new doorway too, you will need to make the necessary preparations and measurements now. Mark off the floor plate and cut it to size – the floor plate should be able to fit into the gap perfectly, nailing the floor plate to the floor with the same 400mm intervals like you did for the ceiling. Building a stud wall isn’t a quick task I’m afraid. Put each of the measured timber studs either side of the ceiling and floor plates (this is probably going to be a little tight, so a little force may be needed). Proceed to drilling the clearance holes for the screws on the end studs. Make sure that you drill the marked points on the walls, add your wall plugs and reposition the studs if they have moved. Start to fix the vertical studs by nailing an off-cut piece of wood to one side of the vertical stud piece. This is great and acts as a small guideline when you’re filling your frame. You should measure and trim your vertically placed stud pieces, making sure that you hold them at the base with some block supports. Fixing them to the floor with nails at 100mm intervals is heavily advised here. Proceed to attaching them to the ceiling plate in the same way and use a spirit level to ensure that it is all level. Secure the vertical timber studs by cutting off horizontal pieces and placing them between them. Make sure that you secure them with nails. This helps to reinforce the stud framework and helps secure the stud wall spacing. So don’t forget. 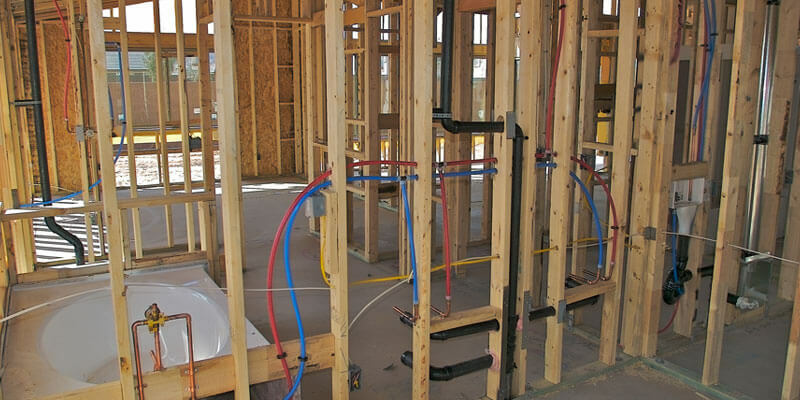 The cabling for electrical items and metal pipework for plumbing needs to have a place to run. If pipework and data cabling were left to run freely, then there would be a significant number of problems cropping up in the long run. One, use a hand saw to cut part way through the timber. These sections that have been removed can make way for plumbing pipework. Two, use a hand drill to cut through the centre on the timber behind the stud wall. Anyone that is familiar with DIY and stud wall thickness will have a good idea of how to do this if you’re not sure. The small hole that is created should be large enough for small cables to run through without a problem. You will need to measure your plasterboard precisely in order for it to fit your stud frame perfectly. Fortunately, we’re going to tell you exactly how you should do it. Cut the plasterboard sheets to size. We recommend no less than 12mm less than the floor and ceiling height. Mark the cutting section on the lighter, ivory side of the plasterboard. Grab yourself a small craft knife to make the cut. Now that you have made the first cut – turn the board over, bend it gently and cut it again to separate the board. Simply rinse and repeat this until you have enough plasterboard building materials for your stud wall. For an experienced builder, fitting a bit of plasterboard is as easy as completing a series of removals in London is for a local man and van. There’s just a few things to remember. Use one large piece of plasterboard and place it over the width of the door stud frame. Use a small off-cut piece of timber and a chisel to wedge underneath. This helps to secure the plasterboard into place while you are nailing it. Simply grab some plasterboard nails and secure the board into the stud frame at 150mm intervals. You have just learnt to save yourself a considerable amount of time building a stud wall. If you loved this guide – remember to share it on Facebook and Twitter. Go ahead – do it now.